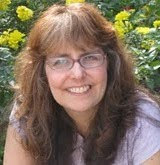 Today I’m excited to interview debut author Lea Nolan. Her book, CONJURE, was released on October 23, 2012. I’m excited to share this with you because it involves hidden pirate bounty and unleashing a Gullah curse. Doesn’t that sound fascinating? Hi Lea. Thanks so much for joining us. You’re very welcome! It’s a pleasure to be here. I’m a wife and mom to three youngish, school-aged kids. I grew up in a small town on Long Island, New York and was always near the water. After my husband and I settled in Maryland, we both missed the water so much that we decided to move to a town that’s closer to the Chesapeake Bay. Our community has its own private beach off a river that feeds into the Bay. I love going to dock side restaurants to eat crabs, which are a Maryland specialty. As for how I started writing fiction, it happened after I read Twilight. Like many recent writers, I was inspired by the powerful emotional feelings Stephenie Meyers conveyed in that book. It reminded me of how earth-quaking first love can be and spurred my interest in YA fiction. I’d already been a non-fiction/health policy writer for more than 15 years so I had the basic necessary mechanical knowledge, but I lacked a background on the genre. Like a good researcher, I read a bunch more YAs then decided to give it a try. My first manuscript took me six re-writes before it was good enough to query agents. That manuscript is still unpublished, but my next became CONJURE and sold in a three-book deal! 2. 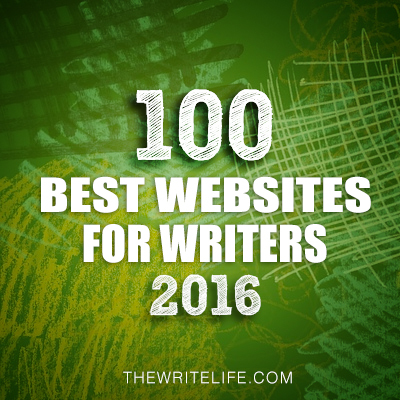 Awesome how a book kindled your interest in writing. For me, it was Harry Potter. CONJURE is set in the steamy South Carolina Lowcountry. It sounds like a really interesting setting. What made you pick this setting and what research did you need to do to get the setting right? I picked the Lowcountry for a number of reasons: 1) Pirates were active off the South Carolina coast in the 18th-century; 2) I've always been interested in the Gullah; 3) Hoodoo magic is extremely cool; and 4) The Lowcountry is one of the most gorgeous and romantic places I've ever been. Who can resist the giant live oaks, Spanish moss, lush marshes, pristine beaches and bottle trees? Not me!!! 3. It sounds like you really put a lot of thought into the setting. And you're making me want to go there the way you describe it.. I love the idea of unleashing the Gullah curse. Share a bit about it and how you came up with the idea of including it in your story. The wicked flesh-eating curse is called The Creep. Since I don’t want to spoil it, I won’t explain why it’s got that name but trust me, it’s deliciously, gloriously disgusting! When I decided to write the story, I knew from the beginning that the pirates and their ship were cursed, but I didn’t know how or what had happened to them. But I trusted that I’d figure it out when I needed to. Then one day I was vacuuming and the idea for The Creep popped into my head. I knew right away it was a keeper and there was no way I was going to change it. 4. I love hearing how ideas come to authors. Fun how they come to us when we're doing something mundane like housework. Who was your hardest character to develop and why? How did you overcome the challenges in get the character right? Miss Delia. In the beginning, before I introduced her in the story, I was concerned I wouldn’t be able to write her convincingly or that I wouldn’t do her justice. She’s the ninety-seven year old Gullah root worker who agrees to teach Emma Guthrie the magic to reverse The Creep. A character like that could easily be caricatured or exploited and I was adamant that I wouldn’t do that to her. I did a lot of background research on the Gullah, their culture and mythology, and hoodoo magic to make sure I handled things as factually possible, although I knew I’d have to take some artistic license here and there to keep things interesting in a novel. Then I sat down to write Miss Delia. From her first line of dialogue, her personality came across so strong and wise, as well as compassionate that I knew there wouldn’t be a problem. She demanded respect and no one was going to deny her. 5. How are you planning to market your book and what’s Entangled Publishing doing to help you with this? Entangled has helped me just about everything I’m doing! 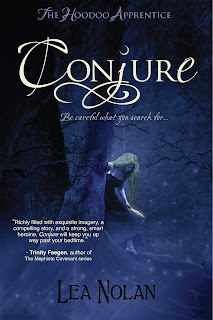 Two months before CONJURE’s release we had a fantastic cover reveal event with over 130 bloggers and authors with blogs which helped to raise visibility and anticipation. Then a month before publication we distributed tons of digital ARCs to fabulous bloggers which also helped to create a bit of buzz. 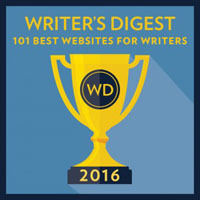 My publicists at Entangled have also put together a superb blog tour with more than 40 great sites like Literary Rambles. I’ve also created a street team called The Apprentices which is open to anyone who’s interested in helping spread the word about CONJURE and the rest of the books in The Hoodoo Apprentice Series. It’s a great way for me to get to know enthusiastic readers better. Members get special sneak peeks and story tidbits, exclusive swag, and are entered for a monthly prize. I’ve also invested in a bunch of book swag to give away at blog stops, Facebook and Twitter contests, signings, library events, and schools. And I’ve also got a dedicated Facebook Page for The Hoodoo Apprentice Series. 6. That's awesome that your publisher is helping so much. And it sounds like you've got a great marketing plan in place. For all us aspiring authors, what advice do you have on the querying process? Take a log-line/query workshop. 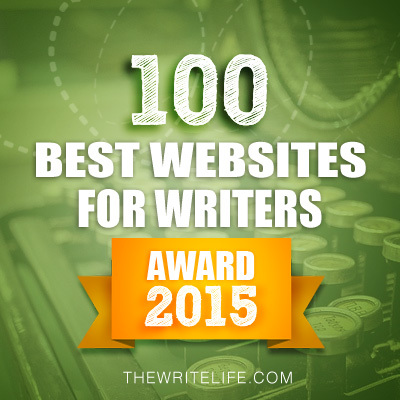 You can find them through Savvy Authors and RWA affiliated chapters as well as other places. Although I tried to write a competent query before I took a workshop, none of them were right. It wasn’t until I took a class that I really learned how to write one of these monsters. You get outstanding feed back from your professional instructor(s) and your fellow students. Then, after you’ve finally got a great, vetted query, don’t blanket the agent world with it. Send it out in small batches of between 5-10 agents. If you don’t get any requests for partials or fulls, there’s a good chance your query still needs work. 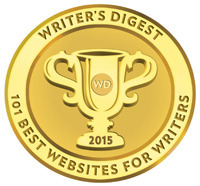 Pull it back, share it with writers you respect to get their opinion, tweak and try again. Also, make sure you do your research when selecting agents. Read their websites, any blogs they’ve visited, interviews they’ve given, their twitter feed, etc. to get a sense of what they’re looking for and if you’re a good fit. 7. That's all such great advice. And timely for me because I'm hoping to query for the first time after the list of the year. What are you working on now? I’m working on CONJURE’s sequel, ALLURE. The plot gets darker and more creepy and takes some very surprising turns. I can’t wait to see what people think of it! Thanks so much for having me, Natalie! I had a great time visiting with you! Thanks Lea for sharing all your great advice. Good luck with your debut. You can find Lea at her website, on Facebook, Twitter and on Goodreads. CONJURE is available at both Barnes and Noble and Amazon. 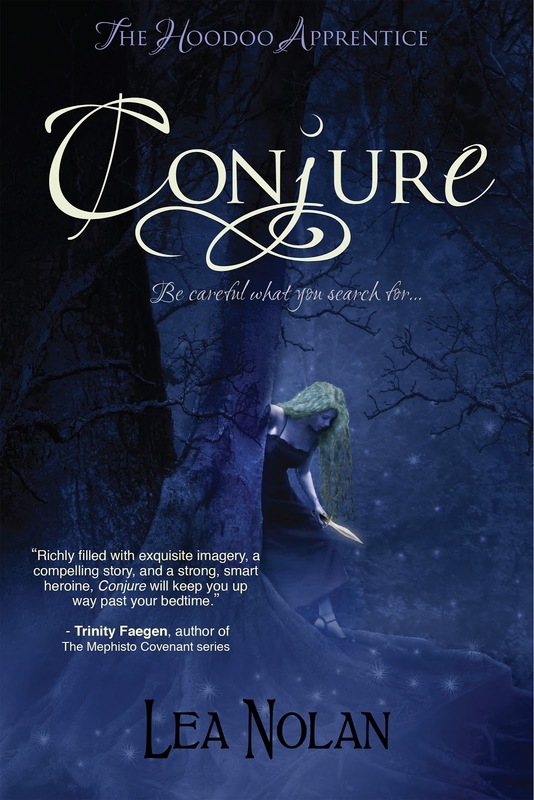 Lea and her publisher generously are offering a copy of CONJURE for a giveaway. To enter, all you need to do is be a follower (just click the follow button if you’re not a follower) and leave a comment by midnight on November 17th. I’ll announce the winner on November 20th. If your e-mail is not on Blogger, please list it in your comment. On Friday I'm hosting debut author Chris Howard and giving away a copy of his book ROOTLESS, a dystopian world about a world about trees. Does it sound like a unique dystopian story? Next Monday I'm interviewing J.A. Souders and giving away a copy of her new book RENEGADE, a fantasy about an underwater world. I'm anxiously awaiting the copy for the giveaway from her publisher so I can read it. 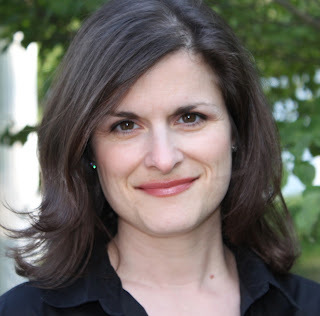 Next Wednesday I'm interviewing agent Mary Kole and giving away a copy of her new book, WRITING IRRESISTIBLE KIDLIT: The Ultimate Guide to Crafting Fiction for Young Adult and Middle Grade Reader. We'll also be talking about what she's looking for in submissions so be sure to stop by. I think this book looks great. The whole Hoodoo premise intrigues me! Great interview. I love Lea's suggestions about querying. Excellent advice! A powerful MG book inspired my current MS too. I love how other writers create creativity in others. That's good query advice to send them out in small batches. Also, you might get feedback on your sample pages that will help you revise for the next round. She has a lot of great advice!! This book has been getting a lot of buzz lately. I'm definitely intrigued! Great interview! And thanks for the giveaway! Conjure sounds awesome! The Creep is one of my worst nightmares come true! Agree! What a great interesting interview! I've heard wonderful things about Conjure and I can't wait to read it! Sounds like an awesome book!! Love the cover and love the creepiness of the creep! Gloriously disgusting sounds awesome ... at least in a fictional setting! I love reading what others plan to do for marketing, though I already knew some of Leah's plans. We were in the same YA author branding workshop through the fab YARWA. COOL!! I love pirates and magic and doom an deadlines. Yeah! Sounds like a great read! Terrific interview.... AND a three book deal! WOW! That is very impressive for a second novel. Congrats Leah ... all the best! Thanks for sharing Natalie. It is fascinating to see how new novelists are marketing themselves these days. Aaargh, I do love pirates! Love how you decided to go into writing, Lea. I've heard other writers say that Stephenie Meyesr was their inspiration, as well. If I had to pick an inspiration, it'd be Harry Potter. But I did read and enjoy all the Twilight books. Can't wait for the last movie - coming out soon. Hi Natalie *waves* Great interview! I like the idea of a Gullah Curse. The book title Conjure is cool. Thanks Natalie for this author interview. Freaking auto correct. Lol. What I tried to say is that I love pirates and am looking forward to this one. Glad you are getting such great support from your publisher, too! Congrats! This sounds like a great book, and taking a querying class is some advice I'm going to take. Thanks! Oh, and I shared this link on Facebook and I'm sticking it on my goodreads list (I don't know if that counts for another entry). Whether I win or not, this book sounds great! Very cool cover! The Creep sounds awesomely disgusting - my students would love it!! This sounds like a great book!! Would love to read it! THE MOVIE HOUSE MYSTERY Winner!